The primary use of blepharoplasty is for improving the cosmetic appearance of the eyes. In some older patients, however, sagging and excess skin surrounding the eyes can be so extensive that it limits the range of vision. In those cases, blepharoplasty serves a more functional purpose. Blepharoplasty is one of the most common cosmetic surgical procedures. 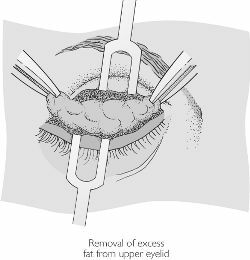 The illustration above depicts a procedure to eliminate dermochalasia, or baggy skin around the eyes. treatment. A good medical history is important. The surgeon will want to know about any history of thyroid disease, hypertension, or eye problems, which may increase the risk of complications. Blepharoplasty can be performed on the upper or lower eyelid; it can involve the removal of excess skin and fat deposits and the tightening of selected muscles surrounding the eyelids. The goal is to provide a more youthful appearance. The surgeon will begin by deciding whether excess skin, fat deposits, or muscle looseness are at fault. While the patient is sitting upright, the surgeon will mark on the skin where incisions will be made. Care will be taken to hide the incision lines in the natural skin folds above and below the eye. The patient then receives injections of a local anesthetic to numb the pain. Many surgeons also give the patient a sedative intravenously during the procedure. After a small, crescent-shaped section of eyelid skin is removed, the surgeon will work to tease out small pockets of fat that have collected in the lids. If muscle looseness is also a problem, the surgeon may trim tissue or add a stitch to pull it tighter. Then the incision is closed with stitches. In some patients, fat deposits in the lower eyelid may be the only or primary problem. Such patients may be good candidates for transconjunctival blepharoplasty. In this procedure the surgeon makes no incision on the surface of the eyelid, but instead enters from behind to tease out the fat deposits from a small incision. The advantage of this procedure is that there is no visible scar. Ectropion — A complication of blepharoplasty, in which the lower lid is pulled downward, exposing the surface below. Retrobulbar hematoma — A rare complication of blepharoplasty, in which a pocket of blood forms behind the eyeball. Transconjuctival blepharoplasty — A type of blepharoplasty in which the surgeon makes no incision on the surface of the eyelid, but, instead, enters from behind to tease out the fat deposits. Prior to surgery, patients meet with their surgeon to discuss the procedure, clarify the results that can be achieved, and discuss the potential problems that might occur. Having realistic expectations is important in any cosmetic procedure. Patients will learn, for example, that although blepharoplasty can improve the appearance of the eyelid, other procedures, such as a chemical peel, will be necessary to reduce the appearance of wrinkles around the eye. Some surgeons prescribe vitamin C and vitamin K for 10 days prior to surgery in the belief that this helps the healing process. Patients are also told to stop smoking in the weeks before and after the procedure, and to refrain from alcohol and aspirin. An antibiotic ointment is applied to the line of stitches for several days after surgery. Patients also take an antibiotic several times a day to prevent infection. Ice-cold compresses are applied to the eyes continuously for the first day following surgery, and several times a day for the next week or so, to reduce swelling. Some swelling and discoloration around the eyes is expected with the procedure. Patients should avoid aspirin or alcoholic beverages for one week and should limit their activities, including bending, straining, and lifting. The stitches are removed a few days after surgery. Patients can generally return to their usual activities within a week to 10 days. As with any surgical procedure, blepharoplasty can lead to infection and scarring. Good care of the wound following surgery can minimize these risks. In cases where too much skin is removed from the eyelids, the patient may have difficulty closing his eyes. Dry eye syndrome may develop, requiring the use of artificial tears to lubricate the eye. In a rare complication, called retrobulbar hematoma, a pocket of blood forms behind the eyeball. Most patients can expect good results from blepharoplasty, with the removal of excess eyelid skin and fat producing a more youthful appearance. Some swelling and discoloration is expected immediately following the procedure, but this clears in time. Small scars will be left where the surgeon has made incisions; but these generally lighten in appearance over several months, and, if placed correctly, will not be readily noticeable. As noted, if too much excess skin is removed from the upper eyelid, the patient may be unable to close his eyes completely; another surgery to correct the defect may be required. Similarly, too much skin can be removed from the lower eyelid, allowing too much of the white of the eye (the sclera) to show. In extreme cases, the lower lid may be pulled down too far, revealing the underlying tissue. Called an ectropion, this, too, may require a second, corrective surgery. The eye's ability to make tears may also be compromised, leading to dry eye syndrome. Dry eye syndrome is potentially dangerous; in rare cases it leads to damage to the cornea of the eye and vision loss. American Society for Dermatologic Surgery. 930 N. Meacham Road, P.O. Box 4014, Schaumburg, IL 60168-4014. (847) 330-9830. 〈http://www.asdsnet.org〉. Any operation for the correction of a defect in the eyelids. /bleph·a·ro·plas·ty/ (blef´ah-ro-plas″te) plastic surgery of the eyelids. Plastic surgery of the eyelids. the use of plastic surgery to restore or repair the eyelid and eyebrow. Also called brow lift. 1. The surgical removal of the 'baggy' parts of the upper and lower lid. 2. Surgical repair of an eyelid; often performed for ptosis. 1. Any plastic operation on the eyelids. 2. Cosmetic plastic surgery for baggy eyelids. n plastic surgery procedure by which fat is removed from the upper eyelid. Any operation of the eyelid. It may be done for cosmetic reasons (e.g. to erase the signs of ageing) or for medical reasons (e.g. ptosis, entropion, ectropion). See blepharochalasis; dermatochalasis. plastic surgery of an eyelid. Most often done to correct entropion or ectropion in dogs. a V to Y technique for the correction of broad-based cicatricial ectropion. a technique for correction of mild ectropion. a technique for correction of mild central entropion of the upper or lower eyelids. The plaintiff alleged that the surgical site was infected with nocardia during a lower-lid blepharoplasty, which caused her to undergo additional surgery with resulting disfigurement of the eye. A daughter sits with her 55-year-old mother, Jane, who has come over from Liverpool to talk about blepharoplasty (eye bag removal). A daughter sits with her 55-year-old mother, Jane, to talk about blepharoplasty (eye bag removal). 2% on the previous year, followed by blepharoplasty (eyelid surgery), face and neck lifts, breast reduction and rhinoplasty. On the occurrence of blindness in association with blepharoplasty. Lipoplasty remains the most performed procedure, representing 23% of total surgical procedures, followed by breast augmentation at 16%, blepharoplasty at 11. Blepharoplasty and ptosis repair can be performed as a combined procedure in the adults20. In some patients, these changes may occur many years before other noticeable signs of aging, and it is not unreasonable for select patients in their late twenties and early thirties to undergo a blepharoplasty (surgery to alter the appearance of the eyelids). A group of these surgeons from the US go over techniques for rhinoplasty, otoplasty, forehead and brow lifting, facelift, cosmetic management of the neck, minimal incision facelift, blepharoplasty, dermal fillers and botox, and facial skin rejuvenation, with information on anatomy, preoperative evaluation, treatment goals and principles, procedures, complications, cases, and equipment, with photos and illustrations. The only real solution is a cosmetic procedure called a blepharoplasty or eye tuck.